There is a family of plants named brassicas. It includes cabbage, collards, broccoli, Brussel sprouts, etc. The harlequin bugs love them. Eat holes in them overnight. A study on the internet shows up this information, from the 1930's! "Natural Enemies. Harlequin bug appears to be relatively free of natural enemies, other than for egg parasites and general predators. The egg parasitoids are Oencyryus johnsoni (Howard) (Hymenoptera: Encyrtidae), Trissolcus murgantiae Ashmead, and T. podisi Ashmead (both Hymenoptera: Scelionidae). The best known species is O. johnsoni, which is reported frequently from harlequin bug eggs, and caused up to 50% mortality during a harlequin bug outbreak in Virginia (White and Brannon, 1939). This parasite is widely distributed, and apparently has other hosts. It attacks eggs in all stages of embryonic development, and prevents them from hatching (Maple, 1937). 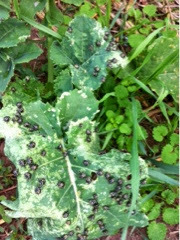 However, O. johnsoni is not the only effective parasite, as T. murgantiae was observed to parasitize 45% of harlequin bug eggs in North Carolina, at locations where O. johnsoni parasitized only 30% of eggs (Huffaker, 1941). Because of its effectiveness, T. murgantiae was introduced into California (DeBach, 1942)." This was the only mention I could locate on these predators. What I need is information on what attracts these two predators to my farm. It would be nice to distribute what we plant to our customers. Prefer to pick and put plants in share boxes rather than pick stinky bugs and put into buckets of soapy water.